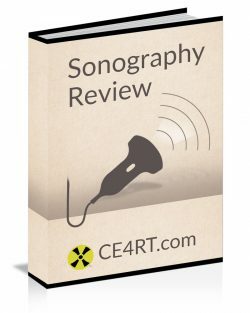 Get 24 Sonography CE Credits now. Guaranteed**. Category A credits as well as CQR Credits (Continuing Qualification Requirements). ARRT* STRUCTURED EDUCATION CREDIT DISTRIBUTION FOR THIS COURSE. This chart may not show the total number of approved category A CE credits. The total number of CE Credits is in the headline at the top of this page. This chart shows the credit distribution the ARRT* has assigned to this activity for R.T.s who are meeting their structured education requirements (ie. while pursuing a credential using the postprimary pathway). The code on the left shown in the DISCIPLINE column represents the ARRT* content outline for the disciplines. This chart is also for R.T.s who are meeting their prescribed CE requirements (as part of the CQR process.) What is the CQR process? The American Registry of Radiologic Technologists (ARRT*) accepts our courses for CE Credits. The Texas Medical Board (TMB) accepts our courses for Medical Radiologic Technologist Continuing Education. The Florida Department of Health Bureau of Radiation Control (FLBRC) accepts our courses for Full and Limited RT CE. The California Department of Public Health Radiologic Health Branch (CARHB) accepts our courses for Radiologic Technologist CE. The American Registry for Diagnostic Medical Sonography (ARDMS) accepts our courses for Ultrasound CME. The Nuclear Medicine Technology Certification Board (NMTCB) accepts our courses for Nuclear Medicine CE Credits. The Society of Diagnostic Medical Sonography (SDMS) accepts this course for Ultrasound CME. Our courses are recognized by Canadian provinces for Continuing Professional Development Credits / hours. Unlimited time to take the exam. You don’t have to finish today if you don’t want to. Work is saved as you answer each question online. The ability to log off and continue the online test whenever you like even from different devices. ASRT approved ARRT* Category A Continuing Education Credits. No Faxing, No emailing back and forth, no paper. A Certificate of completion immediately downloadable after passing the test. The freedom to use different devices at different times during the same exam attempt. Phone, text, forum, and email support. All available courses are approved by the ASRT for ARRT* and every state’s Limited License Radiographer Continuing Education Credit. This is not a paperback or hardcover book. Nothing will come in the mail. This means you can start right now. Our courses follow ARRT* Rules and are approved for the number of credits based on the amount of time it takes the reviewing body (ASRT) to read the entire reading material word for word and cover to cover. This time does not include taking the required post test. These requirements are followed for all reading material for all CE providers. Many students are able to skim the material faster and search for the post test questions much more quickly than that, but the number of credits is a guideline for how many hours it will take to complete the course. How many questions are in the test? In order to get credit, the post test must follow ARRT* CE rules. The rules have been recently updated in 2016. This means that there are 8 questions for each 1 credit to a maximum of 120 questions. So, a 1 credit course has 8 questions, a 4 credit course has 24 questions, and so on, but anything over 15 credits has 120 questions. Again, this is the standard which all accredited courses must follow from any provider. – Credits that are accepted by any Radiologic Technologist, Nuclear Medicine, or Ultrasound registry in North America or US territories. – A system that works with your smartphone and pc. – Fast customer support if you need it. – Electronic reading material that you can keep and share. – An online post test that you can take from multiple devices. – A printable hard copy of the post test for offline reference. – A certificate of completion you can download immediately after passing the post test. – A full refund within 30 days if you do not pass or are not satisfied for any reason. – The lowest price with our Low Price Guarantee. No other X-Ray CE provider offers you a guarantee like this. Try us today with no risk. All available courses are approved by the ASRT for ARRT Category A CE Credit. The ARRT accepts this approval. ALL US state agencies also accept this as approval for full and limited permit CE requirements. Most other registries in north america also accept this approval for RT and Ultrasound CE credits. Some states require specific subjects so check with your state agency.